Murky water lapped below, buffeting the children in life jackets and daring adults risking the adventure with no protection. I stood on a dripping ledge chiseled out of pure limestone with steamy air swirling in my sight. My bare feet rested on a sodden doormat precariously placed before a sharp, brown ledge. Behind me blared a sign with worn edges and big red letters, warning swimming and jumping were at my own risk. This was no ordinary pool or even an old-fashioned swimming hole. This was a cenote, built by centuries of rainwater slowly dripping from the surface through porous rock, eventually carving an eerily circular hole into the earth. I had descended a dank staircase leading hundreds of feet underground with only a chain attached to the wall for safety, leaving my hands smelling like tangy metal. Above, it was blisteringly hot, but down here, the air cooled with each step. Reaching the bottom, I gasped, but no one heard as splashing echoed off the walls. Tree roots and a waterfall mixed playfully in a race to the bottom from the surface, determinedly grasping for the water at my feet. Another sign shrieked the water was 150 feet deep, and I gulped. To my left was a wooden ladder leading into the pool, with black fish swimming through the rungs. To my right was what I stood on now, a manmade stair in the rock on the cavern’s side culminating in a platform leaving me with only two options: Jump, or admit fear and go back down. My life didn’t flash before my eyes, but I went back to my first year in college. My friends and I, young with time to kill, were home for summer break and swimming in my parents’ pool. It was the opposite of a cenote. Blue water, a non-slip floor, and a rectangle cut into the ground, deep enough just to erase the soybean fields on either side. We grew bold as the evening grew dark, removing our clothes and diving into the pristine pool. Each person jumped, a shadowy outline in the night, but we all shouted our biggest fears before landing in the water. Then, my brain flickered to a new, painful memory. My grandmother passed away a month before, and the wound still bled at barely a touch within my mind. She and I had always enjoyed an understanding. Her words made more of an impact than others’ did, and she once told me, “When I take my morning shower, I wash all my negative thoughts down the drain. That way, they don’t disturb me all day.” That stuck with me, considering I own a brain that regularly attacks itself, and the advice played like a loop as I mourned her death. Tears can wash down a drain, but they always return. Sia’s song Chandelier was like a hymn then, her voice a knife diving over and over into my heart: “I’m gonna live like tomorrow doesn’t exist/Like it doesn’t exist/I’m gonna fly like a bird through the night, feel my tears as they dry.” Alone in my room, curled in a ball and convulsing like a doll controlled by a child, I always begged the impassible walls for my panic to subside. I bleakly wondered who could reach me as my wise grandma once had and heard Sia sing, “Help me, I’m holding on for dear life, won’t look down, won’t open my eyes,” and I put my hands in the air, desperately hoping God was real, my voice breaking. Grandma had been my ally, the one who held my hand through it all. Here I stood a month later, wearing only a pair of thin swimming shorts, preparing to leap into the misty air of a Mexican cenote, disturbing the afternoon nap of a few fish, and remembering my grandma laid to rest 1,500 miles away. She would have loved to know I did this. Steeling myself, I crouched, thinking of my friends too, and launched into the air furiously pedaling my body into a missile. Adrenaline shot through me like a drug, and I flew in the sparkling, sunshine-sweetened air, my wild laughter filling the cavern until I splashed. Surfacing, my mouth opened wide in jubilation, and the glittering water I wiped from my eyes wasn’t salty tears. I imagined my fear and doubt falling to the bottom, washed down the drain. 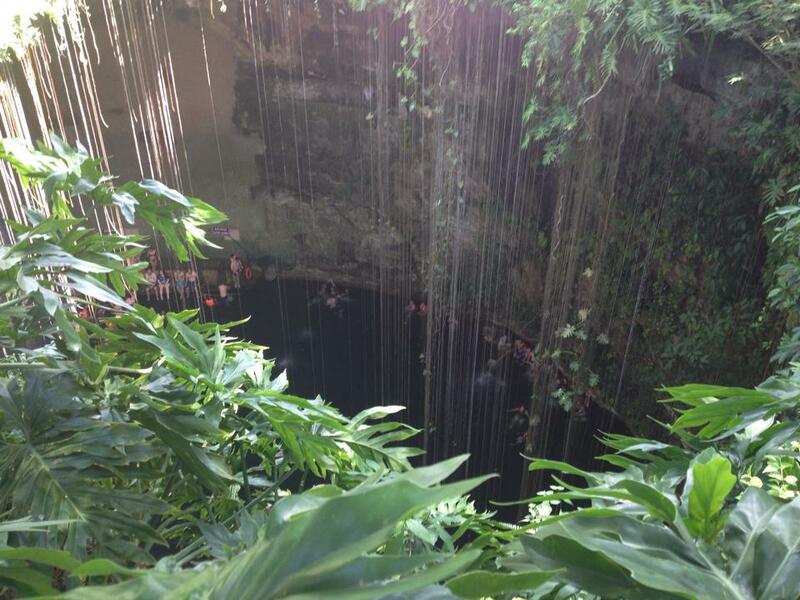 This entry was posted in travel and tagged cenote, healing, mexico, travel. Bookmark the permalink.